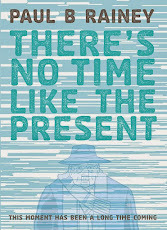 Item: Staff and customers of OK Comics have voted There's No Time Like The Present one of the best graphic novels of 2016. 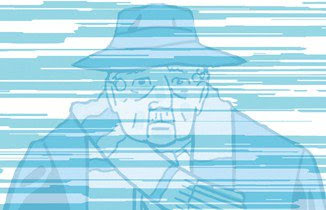 "Character drama about normal people in a world where time travel exists." 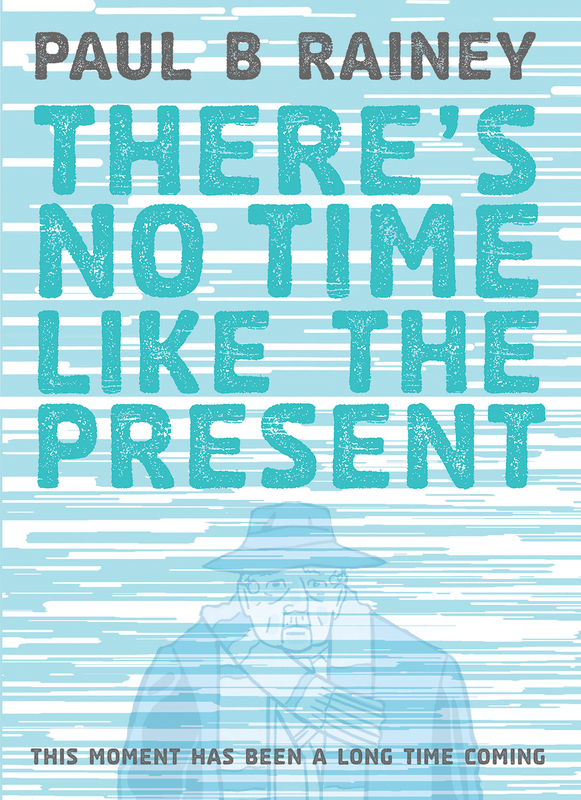 You can buy the exclusive and limited signed print edition of There's No Time Like The Present exclusively from OK Comics in Leeds. 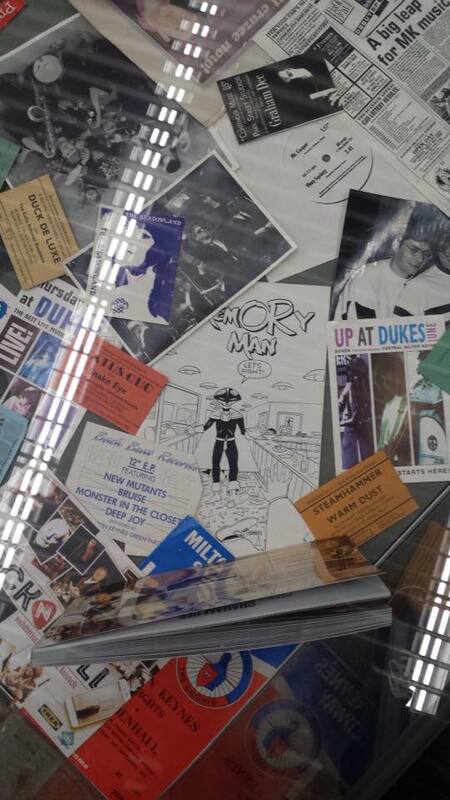 Item: We Built This City On Rock And Roll is an exhibition of photographs and paraphernalia on the Milton Keynes music scene curated by Lee Scriven currently taking place in the City Central Library's exhibition space. 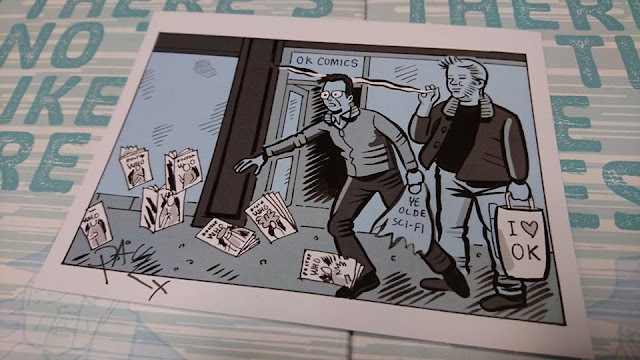 It includes some work from me including a cased copy of Memory Man from twenty-two years ago (photo below) and a HUGE reproduction of a comics-strip Lee and I did together about Trevor Marshall. Item: An interview I did with Chris Thompson for the Pop Culture Hound podcast is now available online for you to download and listen to here. 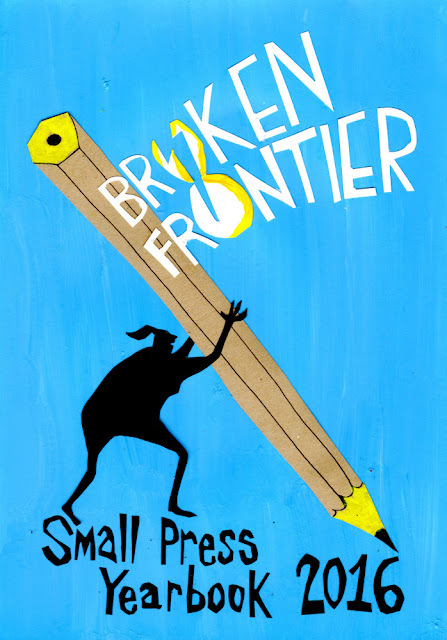 Andy Oliver reviews my comic, Tales To Diminish, on The Broken Frontier website. "With its rhythmic pacing, accessible cartooning clarity and stinging parody, Tales to Diminish is the perfect showcase for an artist who has been consistently producing quality small press comics work for so long that he’s practically the Godfather of the UK small press scene." You can buy a copy from my shop, if you like. There's No Time Like The Present update! I was interviewed by Chris Thompson for the Pop Culture Hound podcast. 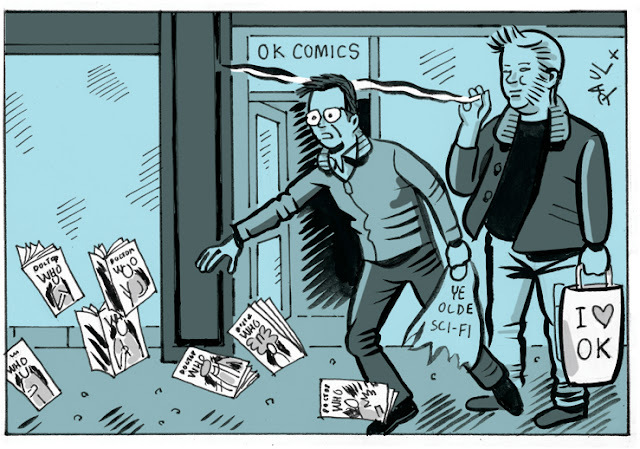 I talked to Chris about my comic work, including my Graphic Novel, There's No Time Like The Present, during a personal appearance at Orbital Comics. You can listen to the podcast here. 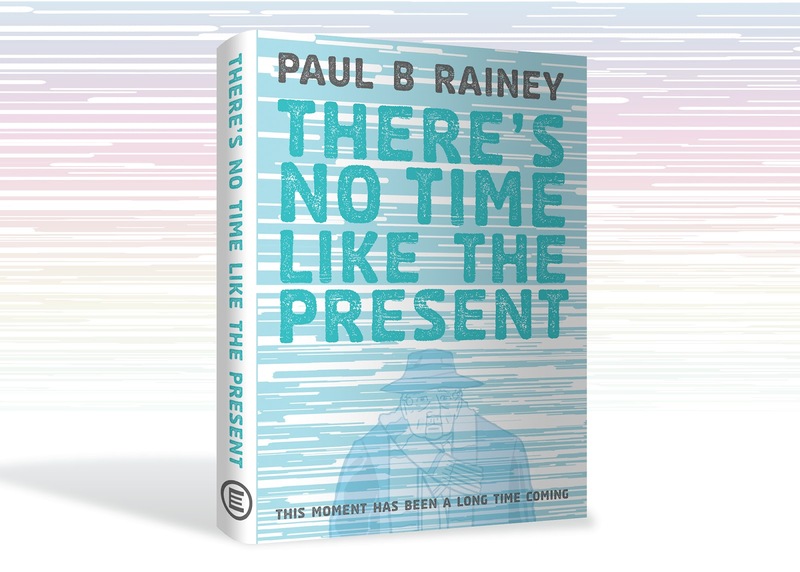 You can buy There's No Time Like The Present from Escape Books here. My current big project, or graphic novel in progress, Why Don't You Love Me?, returns to ACES Weekly volume 25 for its third seven week/twenty-one episode long run. Read the exclusive preview below. Each issue of ACES Weekly costs £1. You can read volumes 21 and 23, which also featured 21 episodes of my comic-strip each, here. 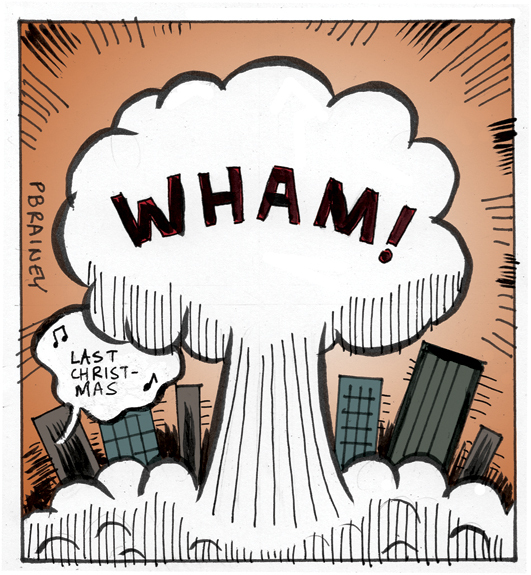 I and fellow cartoonist Peet Clack will be exhibiting at this Saturdays Nottingham Comic Con. I will be selling copies of my comics Tales To Diminish, Pope Francis Goes To The Dentist and more. If you're in the area, please pop by and say hello. You will be able to find us on table L67. 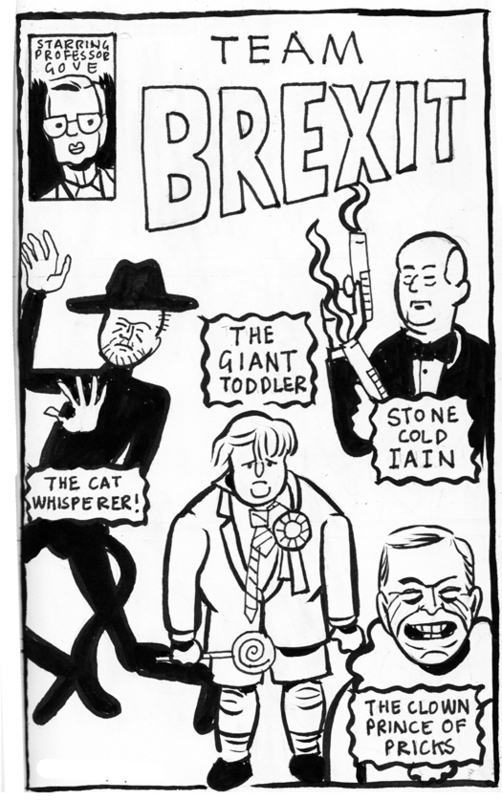 I will be exhibiting with fellow cartoonist Arthur Goodman at this weekend's ICE (International Comic Show) taking place in Birmingham. You can learn all about the show here. 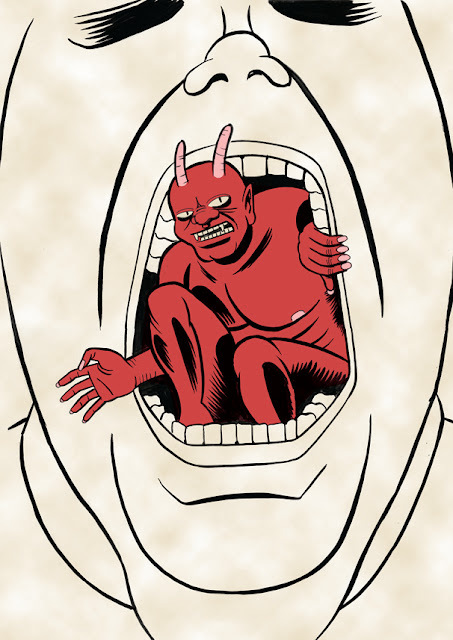 I will be selling copies of all of my comics currently available for sale from my shop including Tales To Diminish, Pope Francis Goes To The Dentist and There's No Time Like The Present. You'll be able to find Arthur and me on table 36. I will be exhibiting with my friend Peter Clack and this weekend's NICE (Northant's International Comic Expo) taking place in Bedford. You can learn all abut the show here. I will be selling copies of all the comics currently available for sale from my Shop including Tales to Diminish and There's No Time Like The Present. 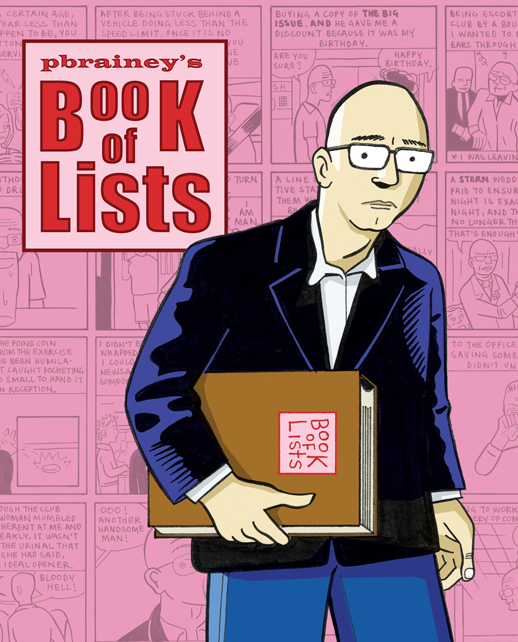 Making it's premier at NICE will be the brand new print of Book of Lists. If you're attending the event or in the area then please pop by and say hello. Nottingham's Page 45 comic shop has reviewed Tales To Diminish on their website. "...a master of the visual punchline as well as the satirical stiletto in the ribs." Please read the full review here. I will be premiering my new comic, Tales To Diminish, at this weekend's London Film and Comic Con on Saturday at Olympia London. I will be on the Escape Books table where I will also be signing, sketching and selling copies of There's No Time Like The Present, Pope Francis Goes To The Dentist and Thunder Brother: Soap Division. If you're in the area, please pop by and say hello. 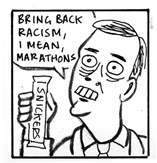 My brand new comic is now available to buy directly from me here. 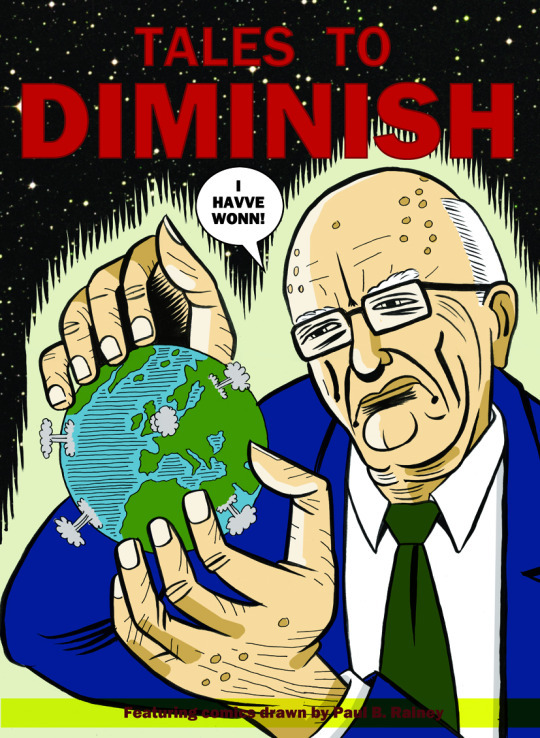 Tales To Diminish is a 28 pages long, magazine sized comic collection of strips I have drawn over the last two years including Man V Van, Peter The Slow Eater, Tales To Diminish and many, many more. The price is just £4.50, which includes the cost of post and packing in the UK. Please use the Paypal button below to buy a copy. If you don't have a Paypal account or live outside of the UK then please email me here for alternatives. The great Page 45 of Nottingham have reviewed my comic, Pope Francis Goes To The Dentist. "This is the most consistently funny, and daft, selection of peculiarly British shorts I've read for a while." You can read the full review here. After its successful appearance all the way through volume 21, Why Don't You Love Me returns to ACES Weekly for a second 21 episode run. 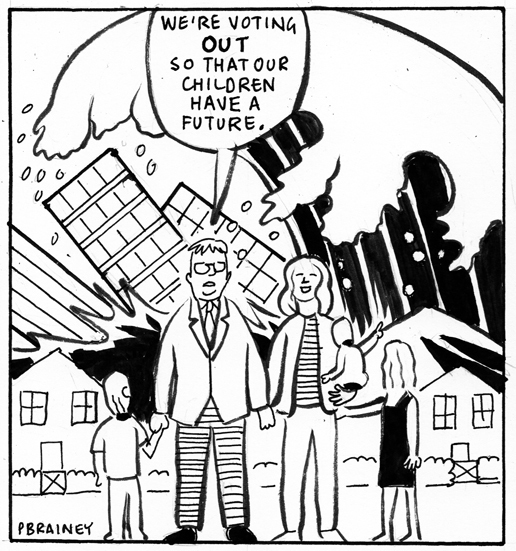 My current big comic-strip project will appear throughout volume 23 starting in the on-line weekly on Tuesday July 19th. Each issue of ACES Weekly cost £1. You can read the entirety of volume 21, featuring the first 21 episodes, here. If you are someone who likes to try before they buy then you can now see copies of my new comic, Pope Francis Goes To The Dentist, for sale from each of the following shops. Of course, you can also buy copies directly from this me here. Page 45, one of the planet's most discerning comic-shops, has published a review of There's No Time Like The Present. 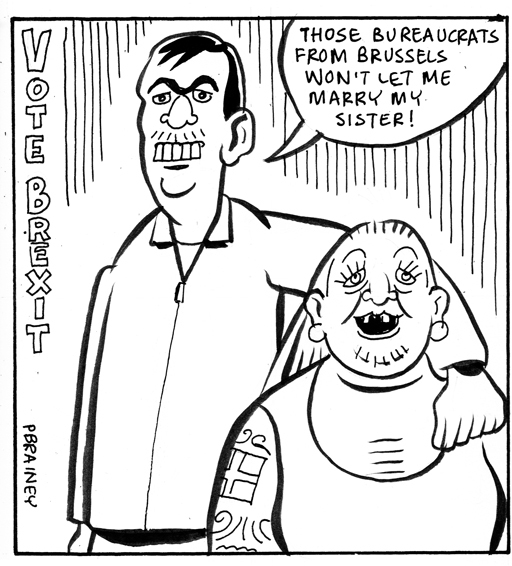 "If I had to sum this up in a single sentence I would have to say it's like Gilbert Hernandez crossed with VIZ. In other words, utterly brilliant." You can read the whole review written by Jonathan here. 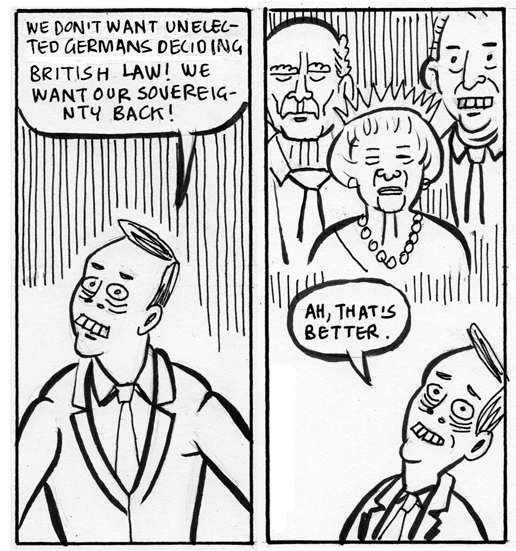 Here are some Hasty Comics I have drawn inspired by the EU Referendum. 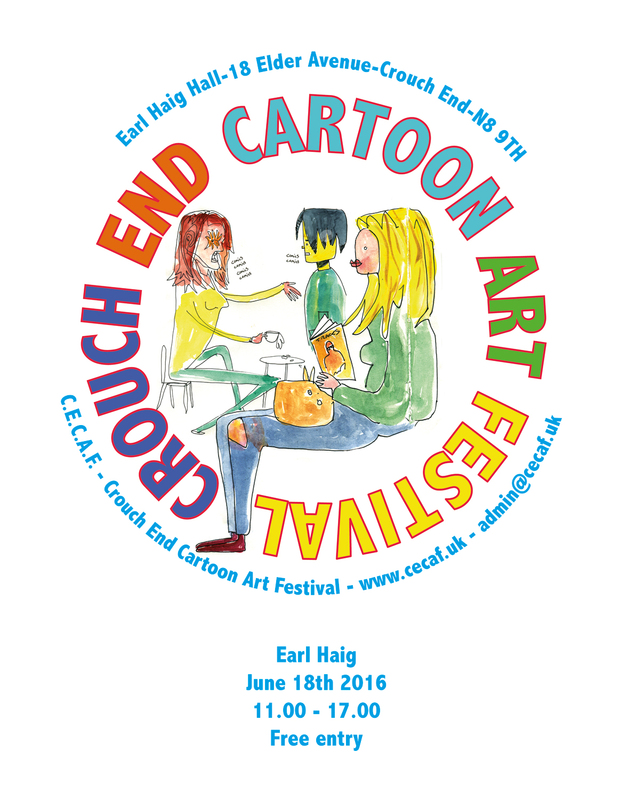 I don't attend many comic events anymore but I do try to exhibit every year at the thoroughly enjoyable Crouch End Cartoon Art Festival. This years CECAF is taking place on Saturday (June 18, 11 AM to 5 PM) at the usual location of Earl Haig Hall, 18 Elder Avenue, Crouch End N8 9TH. Loads of great comic creators will be there, and myself, sharing a table with the publisher of my graphic novel There's No Time Like The Present, Escape Books. Entry is FREE! I hope to see you there. As you may know, I have only produced a modest run of my new comic Pope Francis Goes To The Dentist but I have enough copies to be able to supply a small number to comic shops for sale. So, if you like to try before you buy, then you can get copies from GOSH and Orbital Comics in Central London and OK Comics in Leeds. If you don't have access to these shops, then you can order directly from me here. 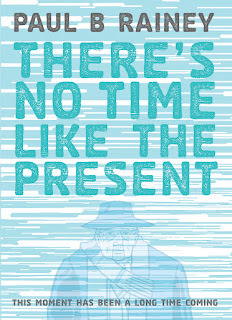 Item: A special signed book plate edition of my graphic novel, There's No Time Like The Present, is now available to buy exclusively from OK Comics in Leeds for the same price as the regular version of the book. 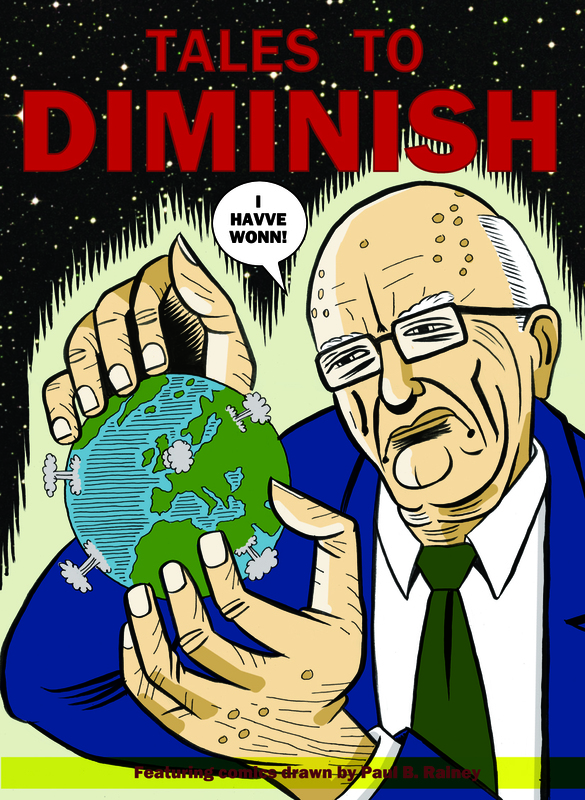 It feature exclusive artwork drawn and signed by me. You can buy a copy from the actual shop right now and from their on-line store sometime over the next fortnight. Item: I have a comic-strip appearing in the Broken Frontier Small Press Yearbook. The collection focuses on six newer creators backed up with work by old veterans like myself. It really is a strong collection and great value for money. You should buy a copy. My new comic, Pope Francis Goes To The Dentist, appears on the Broken Frontier website as one of their staff picks this week. "A wonderful collection of running jokes and bizarre gags". You can order a copy for just £2.60 from here. If you're in London on Saturday, please drop by the Comica Comiket event taking place beneath the West Handyside Canopy, adjacent to the House Of Illustration and Central Saint Martins, not far from Kings Cross and St. Pancras train stations. 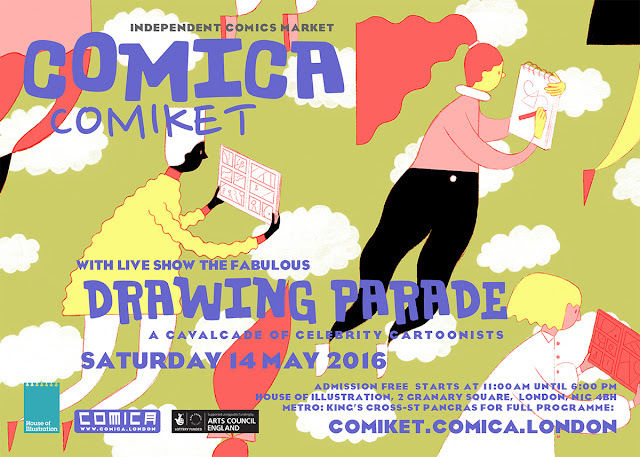 Along with many talented cartoonists and comic creators, I will be there, signing and sketching in copies of my graphic novel, There's No Time Like The Present, at the Escape Books table and live drawing on the big screen at 1 PM as part of the fabulous Drawing Parade. Entrance is free. Also for sale from the Escape Books table will be copies of my new self-published comic, Pope Francis Goes to The Dentist, of which I have produced a very limited print run. 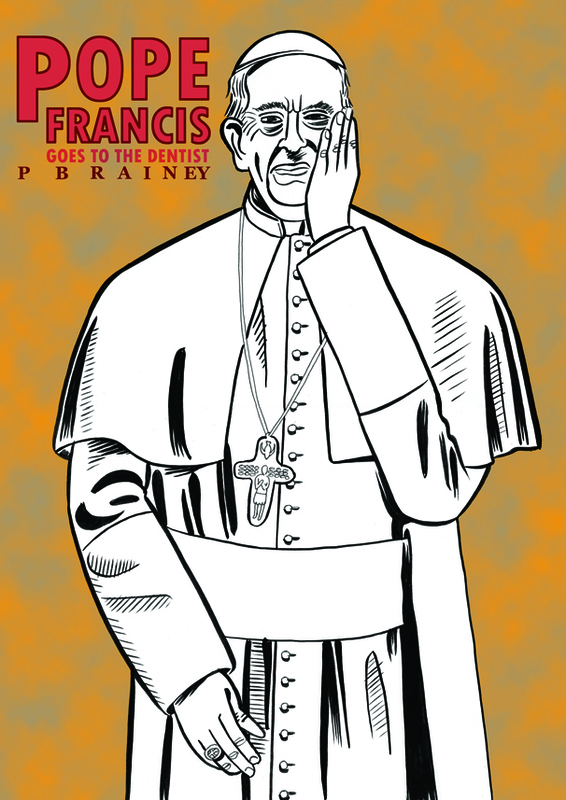 The comic features Pope Francis Goes To The Dentist, 14 Year Old Stand-Up Comedian and many other strips that I have drawn over the last two years as well as exclusive art. If you're unable to attend Comiket then please don't worry as copies will be for sale from this website soon. 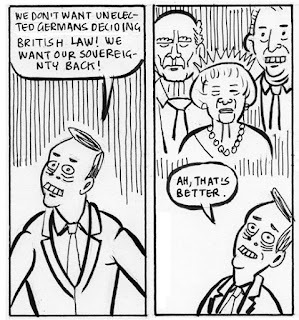 I've been interviewed by Tom Mortimer for the Dirty Rotten Comics website. In it I talk about There's No Time Like The Present, Why Don't You Love Me and my despondency with the current comic convention scene. You can read the entire interview here. Volume 21 of on-line comic, ACES Weekly, is now complete and with it the opening run of my current big comic-strip project, Why Don't You Love Me. 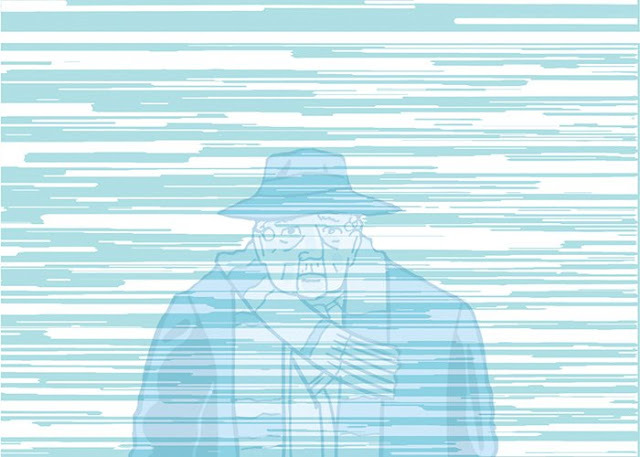 All twenty-one episodes, spread over the seven issues, can now be streamed in one go from here. I'm delighted to announce that the next run of Why Don't You Love Me has been scheduled to be appear in Volume 23 of ACES Weekly beginning on July 18th. I hope to see you there. In the meantime, here's the second episode as a teaser for you. 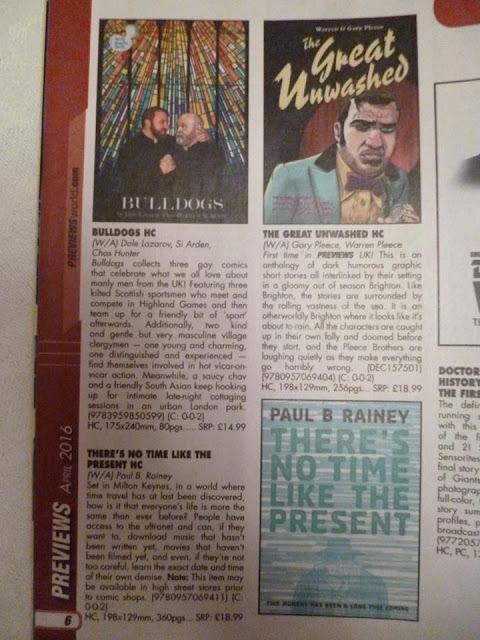 I understand that There's No Time Like The Present is listed in Diamond Distributors current Previews catalogue in the UK section. If you haven't got a copy of my graphic novel yet, it would be brilliant if you ordered it through your local comic or book shop. Perhaps they'll order one or more copies for the shelves if you do.